IL-10 is an anti-inflammatory cytokine. During infection it inhibits the activity of Th1 cells, NK cells, and macrophages, all of which are required for optimal pathogen clearance but also contribute to tissue damage. In consequence, IL-10 can both impede pathogen clearance and ameliorate immunopathology. Many different types of cells can produce IL-10, with the major source of IL-10 varying in different tissues or during acute or chronic stages of the same infection. The priming of these various IL-10-producing populations during infections is not well understood and it is not clear whether the cellular source of IL-10 during infection dictates its cellular target and thus its outcome. In this article we review the biology of IL-10, its cellular sources, and its role in viral, bacterial, and protozoal infections. It is widely appreciated that many of the severe complications of infection result from excessive immune activation. Therapeutic and preventive strategies to augment immune-mediated clearance of pathogens and infected host cells have, on occasion, directly exacerbated tissue damage and increased mortality (1, 2, 3). These studies demonstrate that maximal pathogen control does not necessarily lead to minimal disease and highlight the essential role for immunoregulatory components of the immune response in limiting pathology. First described as a product of Th2 cells that inhibited cytokine synthesis in Th1 cells (4), IL-10 is now known to be produced by macrophages, dendritic cells (DC),3 B cells, and various subsets of CD4+ and CD8+ T cells (5, 6). Initially shown to regulate T cell responses, many of the effects of IL-10 on T cell and NK cell function are now known to be indirect, being mediated via a direct effect of IL-10 on monocyte-macrophages. Thus, IL-10 inhibits MHC class II and costimulatory molecule B7-1/B7-2 expression on monocytes and macrophages and limits the production of proinflammatory cytokines (including IL-1α and β, IL-6, IL-12, IL-18, and TNF-α) and chemokines (MCP1, MCP5, RANTES, IL-8, IP-10, and MIP-2) (reviewed in Ref. 5). Importantly, autocrine IL-10 signaling in DC can inhibit chemokine production and prevent their trafficking to lymph nodes as shown in mycobacterial infection, leading to the failure to recruit and induce Th1 differentiation of naive T cells (7). Nevertheless, IL-10 can act directly on CD4+ T cells, inhibiting proliferation and production of IL-2, IFN-γ, IL-4, IL-5 and TNF-α (5, 8, 9). Thus, IL-10 can directly regulate innate and adaptive Th1 and Th2 responses by limiting T cell activation and differentiation in the lymph nodes as well as suppressing proinflammatory responses in tissues, leading to impaired pathogen control and/or reduced immunopathology. IL-10 has emerged as a key immunoregulator during infection with viruses, bacteria, fungi, protozoa, and helminths (Table I⇓), ameliorating the excessive Th1 and CD8+ T cell responses (typified by overproduction of IFN-γ and TNF-α) that are responsible for much of the immunopathology associated with infections including Toxoplasma gondii (1, 10), Trypanosoma spp. (2, 11), Plasmodium spp. (12, 13), Mycobacterium spp. (14), and HSV (15). Thus, as summarized in Table I⇓, ablation of IL-10 signaling results in the onset of severe, often fatal immunopathology in a number of infections including T. gondii (1, 10), malaria (3, 16, 17), and Trypanosoma cruzi (2). IL-10 by itself and through cooperation with Th1 cytokines (such as IL-12) also regulates Th2 responses (8, 9, 18, 19, 20) to prevent the overproduction of IL-4, IL-5 and IL-13, cytokines that can lead to severe fibrosis in, for example, Schistosoma mansoni (reviewed in Ref. 21), hepatitis C virus (22), and mycobacterial (23) infections. Amelioration of the allergic Th2 responses that can accompany helminth infections also depends on the induction of IL-10 (24). Nevertheless, excessive or mistimed IL-10 production can inhibit the proinflammatory response to Plasmodium spp. (25, 26), Leishmania spp. (27, 28, 29), T. cruzi (30), Mycobacterium spp. (31), and lymphocytic choriomeningitis virus (32, 33) to the extent that pathogens escape immune control, resulting in either fulminant and rapidly fatal or chronic nonhealing infections. For example, during Mycobacterium avium infection very early IL-10 production in BALB/c but not C57BL/6 mice is correlated with the failure of BALB/c mice to control the infection; ablation of IL-10 signaling led to enhanced pathogen control in BALB/c but not C57BL/6 mice, demonstrating the causal relationship between IL-10 and the lack of pathogen control (31). Similarly, in other infections where production of IL-10 correlates with poor pathogen control, experimental ablation of IL-10 or inhibition of IL-10 signaling restores pathogen control and reduces the severity of disease, thereby establishing a direct correlation between inappropriate IL-10 production and disease severity. Conversely, ablation of IL-10 signaling during normally benign infections may augment proinflammatory responses, enhancing pathogen control at the considerable cost of more severe immunopathology (1, 2, 3, 17, 34). However, it is often not clear whether high concentrations of IL-10 during virulent infections are a cause or a consequence of high pathogen burdens. In the former case, IL-10 would directly inhibit pathogen clearance (and may be induced by the pathogen to promote its own survival). Thus, transgenic overexpression of IL-10 (under control of the MHC II promoter) in APC leads to uncontrolled pathogen growth in Leishmania major, Listeria monocytogenes, and M. avium infections (35, 36). In the latter case for example, where the pathogen is able to resist clearance by normally effective mechanisms, IL-10 may be produced to reduce inflammation and thereby minimize pathology. For instance, during virulent infection with the SD strain of L. major, high pathogen loads drive excessive Th1 responses (27) and these, in turn, promote the development of self-limiting adaptive IL-10-producing T cells that dampen down Th1 responses, (28, 37), establishing a positive feedback loop whereby T cell-derived IL-10 further inhibits anti-microbial immune responses, allowing fulminant and inevitably fatal infections to develop. In such cases, IL-10 concentrations often “track” pathogen burdens and systemic IFN-γ concentrations (25, 27, 38). Taken together, these studies indicate that resolution of infection requires a coordinated response in which initial proinflammatory mechanisms clear the pathogen and are then down-modulated by IL-10 before pathology occurs. Thus, the timing as well as the relative amounts of proinflammatory and anti-inflammatory cytokine production are critical for safe resolution of infection. It is evident that IL-10 can be produced by many different myeloid and lymphoid cells and that more than one population of IL-10-producing cells may be induced during a single infection (Table I⇑ and Fig. 1⇓). The complexity of IL-10 responses, together with inconsistencies in the nomenclature for regulatory T cell (Treg) populations (natural Treg (nTreg), Tr1, Th3, adaptive Treg, IL-10-producing T cells) and the paucity of markers to differentiate them, has resulted in considerable confusion in the published literature regarding the role of particular cell populations during specific infections. Hopefully, new tools such as IL-10-GFP reporter mice (6) will allow many of these inconsistencies to be resolved. The sources and targets of IL-10 during infection. Interactions between pathogens and APC direct the development of Th1, Th2, or Treg populations depending on the cytokine environment and the level of costimulation. APC promoting regulatory responses are induced by priming under regulatory conditions (often involving IL-10 signaling) or as a result of direct modulation of their functions by the pathogen. IL-10 may act in an autocrine manner to suppress APC proinflammatory responses, may act directly on effector T cells to limit their proliferation and function, or may promote the differentiation of naive T cells into regulatory populations. Adaptive and natural regulatory T cells may then directly influence macrophage (MÔ), DC, and effector T cell differentiation and effector functions via IL-10-dependent mechanisms. aaMÔ, Alternatively activated macrophage; cMÔ, classical macrophage; ROI, reactive oxygen intermediate. Ligation by pathogens of pattern recognition receptors on DC typically causes activation of the DC and cytokine release, leading to the development of Th1 or Th2 effector cells. However, under certain conditions (typically following exposure to IL-10 or TGF-β) DC can initiate the development of Treg that limit these effector responses (39, 40). Myeloid DC are a particularly potent source of IL-10 after TLR-9 ligation (41), and a naturally occurring population of tolerogenic CD11clowCD45RBhigh DC has been identified that produces copious amounts of IL-10 in response to LPS stimulation and can prevent experimental endotoxemia and bacterial peritonitis (42). Thus, the specific DC populations driven to IL-10 production likely depend on the precise nature of the pathogen-associated ligand and the patterns of expression of its receptors among DC. Although IL-10 from DC may protect hosts from immunopathology, for example during Chlamydia spp. infections in which CD8+ DC inhibit Th2 cell activation through ICOS- and IL-10-dependent mechanisms, thereby preventing allergic responses (43), and during Bordetella pertussis infection where TLR-4 signaling on DC promotes the development of IL-10 producing Treg cells that limit lung pathology (44), the modification of DC (and macrophage) signaling pathways to minimize the induction of antimicrobial effector mechanisms is an immune-avoidance strategy that has been exploited by all classes of pathogens. For instance, CD8− DC are a potent source of IL-10 during lymphocytic choriomeningitis virus infection, directly inhibiting viral control (33). Similarly, modulation of TLR-2 signaling by S. mansoni lysophosphatidylserine and by Mycobacterium tuberculosis can lead to DC production of IL-10 and the induction of IL-10-secreting Treg that inhibit effector T cell activity and reduce parasite control (45, 46). In the case of M. tuberculosis, IL-10 production can be blocked (without reducing protective IL-12 responses) by inhibiting TLR-2 function (46). During malaria infection, however, IL-10 provides a sensitive, protective homeostatic mechanism; interactions between parasitized cells and CD8− DC drive a coordinated switch from Th1 to Th2 and IL-10 responses (47, 48) that allow timely control of infection, amelioration of pathology, and secretion of Abs that protect against reinfection. Sustained triggering of TLR-4 or TLR-9 leads to TLR tolerance (47) and, as with repeated administration of LPS, IL-10 appears to induce the differentiation of adaptive Treg (49, 50). Macrophages are potent antimicrobial effector cells that can participate in both proinflammatory (classical) and fibrotic (alternatively activated) responses (51). Consequently, it is not surprising that pathogens have evolved mechanisms to subvert macrophage function or that macrophages are a major source of IL-10 during infection. A population of “regulatory” macrophages has been identified, at least in vitro, characterized by the production of IL-10 following Fc receptor ligation by immune complexes or IgG-coated Leishmania amastigotes (51, 52). IL-10 is also induced in macrophages in vitro following either CD40 ligation or CpG stimulation (41), and modulation of macrophage TLR-2 signaling during Candida albicans (53) infection or following exposure to Yersinia spp. V protein (54) has been shown to drive IL-10 production, leading to the induction of Treg (53) and impaired pathogen control. Importantly, macrophage-derived IL-10 can inhibit differentiation of neighboring cells into classically activated macrophages, allowing the macrophage population to be self-regulating (55). The power of the macrophage IL-10/STAT-3 pathway to facilitate pathogen survival and, thus, the evolutionary advantage conferred by being able to exploit it, is clearly illustrated in toxoplasmosis and mycobacterial infection. Macrophage-derived IL-10 inhibits the apoptosis of M. avium-infected cells, facilitating pathogen survival by maintaining the reservoir of infected cells (56). More remarkably, T. gondii can directly activate STAT-3, bypassing any need to induce IL-10 (57); the downstream effects, i.e., inhibition of IL-12 and TNF-α production, are however identical with those of IL-10, and this subversion of macrophage function likely leads directly to enhanced parasite survival and replication. Natural Treg are constitutively produced in the thymus and express very high levels of CD25. They require IL-2 for both their maintenance in the periphery and for the production of IL-10 (58, 59); their suppressive function is linked to the expression of Forkhead box transcription factor 3 (Foxp3) (60). First described for their role in preventing autoimmune disorders, nTreg can prevent immunopathology in all types of infections (reviewed in Refs. 61 and 62). Although the means by which nTreg regulate inflammation appears to vary between infections (reviewed in Ref. 62), their ability to secrete IL-10 has been implicated in numerous diseases (Table I⇑). IL-10-producing nTreg have been implicated in maintaining the balance between pathogen elimination and immunopathology in viral infections, including HSV-induced stromal keratitis (15), helminth (e.g., S. mansonii; Ref. 34), bacterial (e.g., H. hepaticus; Ref. 63), and fungal (e.g., C. albicans; Ref. 53) infections. During L. major infection the ability of nTreg to limit antiparasitic effector responses (leading to persistent low level infection) is in part IL-10 dependent (64), and ablation of IL-10 is required to fully eliminate the parasites. Interestingly, these all tend, in immunocompetent individuals, to be rather slowly developing but persistent infections. 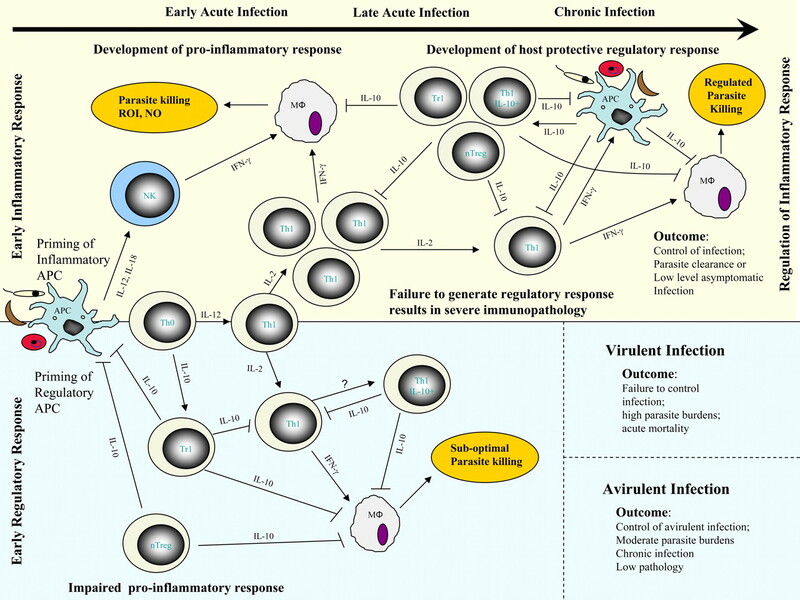 By contrast it is becoming apparent that, in the rapidly reproducing, virulent infections associated with highly proinflammatory immune responses, nTreg may be unable to effectively regulate the immune response and adaptive Treg, which are generated in the periphery during an immune response, tend to act in an Ag-specific manner (reviewed in Ref. 65), and do not necessarily express Foxp3 or CD25, may be more important in preventing immune-mediated pathology. Several populations of adaptive Treg have been defined: IL-10-producing Tr1 cells (66), TGF-β-producing Th3 cells (67), a number of populations of regulatory CD8+ T cells (defined by surface expression of CCR7, CD122, or lack of CD28) that produce IL-10 and/or TGF-β (reviewed Ref. 65), and Th1 cells that coproduce IL-10 and IFN-γ (28, 37, 68). Tr1 cells do not make IL-4, differentiating them from Th2 cells that produce both IL-4 and IL-10 (66). TGF-β, but not IL-10, is required for the development of Foxp3-negative Tr1 cells (69). Recent studies have begun to unravel the pathways leading to IL-10 production by different T cell populations and it is becoming clear that some proinflammatory cytokines directly induce IL-10, allowing immune responses to be inherently self-regulating. Thus, IL-27 and IL-6 (both amplified by TGF-β) promote IL-10 production by Tr1, Th1, Th2, Th17, and CD8+ T cells in a STAT3- and STAT1-dependant mechanism (70, 71, 72, 73), and IL-12 and IL-23 prime CD4+ and CD8+ T cells for IL-10 production (74, 75, 76), suggesting that the IL-12 family of cytokines (IL-12, IL-23, and IL-27) is indeed self-regulating. One of the first descriptions of Tr1 cells was in B. pertussis infection in which bacterial filamentous hemagglutinin (binding to CD61 (integrin β3) and CD47 (integrin-associated protein) on myeloid DC caused them to produce IL-10 that, in turn, induced differentiation of adaptive Treg (77). Tr1 cells are also induced during Streptococcus pyogenes infection; in this case the bacterial virulence proteins M5 and M22 interact with CD46 on the CD4+ T cell, inducing secretion of IL-10 and bystander suppression of effector T cells (78). IL-10-producing Th1 cells have been identified during T. gondii and virulent L. major infections, which are characterized by particularly strong inflammatory responses and high parasite burdens (37, 68), suggesting that development of IL-10-producing Th1 cells may be correlated with the extent of Th1 cell activation and/or the concentration of proinflammatory cytokines. The finding that IL-12 and IL-23 promote IL-10 production by T cells in a dose-dependent manner (75, 76) offers a mechanism by which this might occur. Irrespective of the source of IL-10, its effects are similar in all of the infections that have been studied: IL-10 suppresses macrophage and DC function, thereby limiting Th1 and Th2 effector responses (Table I⇑). Nevertheless, the impact of IL-10 is clearly determined by the timing and site of its production, and these are both likely to be affected by which cells are making IL-10. Moreover, because IL-10 production by one cell population can affect the ability of other cells to make IL-10, there is the potential for IL-10-producing cells to regulate each other. The picture that is emerging is that in infections of low to moderate virulence, i.e., inducing commensurately low to moderate inflammatory responses, IL-10 from DC or macrophages drives the production of IL-10 by nTreg, preventing pathology but allowing long-term escape of pathogens from immune control and giving rise to persistent (typically asymptomatic) infections; examples include C. albicans and mycobacterial infections. Alternatively, in highly virulent infections giving rise to strong proinflammatory responses, IL-10 production from larger populations of induced (adaptive) Treg seems to be required to minimize pathology during the resolution phase of the infection; the ability of Th1 cells to coproduce IL-10 and IFN-γ may favor simultaneous pathogen clearance and suppression of downstream pathologies; examples include T. gondii, malaria, and leishmaniasis (17, 37, 64, 68). We postulate that the strength of the regulatory IL-10 response reflects the strength of the preceding inflammatory response (i.e., IL-6, IL-12, IL-23, and/or IL-27 levels) and that IL-10 from nTreg alone is insufficient to counter the very high levels of inflammation associated with virulent infections. Irrespective of the source of IL-10 (nTreg or Tr1), its production is of potential benefit to both the host (limiting pathology) and the pathogen (allowing persistent infection and thereby favoring onward transmission). However, if the source and thus the timing of IL-10 secretion are inappropriate, i.e., produced too early during a virulent infection or too late during an avirulent infection, overwhelming infection or severe tissue damage, respectively, will result (Fig. 2⇓). The source, timing, and magnitude of IL-10 production determines the outcome of protozoan infections. Early priming and polarization of proinflammatory immune responses are crucial for the effective control of protozoal infection. Proinflammatory cytokine production by APC after interaction with pathogens and the subsequent activation of NK cells and Th1 cells are required to activate macrophages (MÔ) to eliminate microbes. Regulatory DC and macrophages and/or regulatory T cells (Tr1, IL-10-Th1, and nTreg) must then control inflammation to prevent immune-mediated pathology. By contrast, early polarization toward regulatory, IL-10-producing APC populations inhibits inflammation. In the case of avirulent infections, this will allow the pathogen to persist in the absence of tissue damage. In the case of virulent infections, this leads to uncontrolled pathogen dissemination and death. ROI, Reactive oxygen intermediate. The Th1:Th2 paradigm of immunity to infection in which Th1 cells were regarded as proinflammatory and Th2 cells were regarded as anti-inflammatory has undergone a major realignment in the last 10 years and, as in the development of the original paradigm, studies of infection have been crucial to this process. Depending on the nature of the infectious agent, both Th1 and Th2 cells are now known to mediate inflammation and tissue damage as well as pathogen killing. Anti-inflammatory functions, in contrast, are now known to rest with populations of regulatory cells that may be myeloid or lymphoid in origin and can include fully mature, classical Th1 or Th2 cells that produce IL-10 as a negative feedback mechanism to limit their own response. More than any other cytokine, IL-10 is an essential component of this regulatory response in almost all infections. Therapeutic strategies augmenting IL-10 to reduce host injury during infection must therefore be combined with effective antimicrobials to ensure that the underlying problem, the pathogen, is eliminated. Similarly, adjuvant therapies designed to block IL-10 or components of its signaling pathway in order to augment the effects of antimicrobial drugs or vaccines need to be applied with care, because they may have unintended side effects. We thank Dr Julius Hafalla and Dr Brian deSouza for critical reading of the manuscript. ↵1 Current address: School of Pharmacy, University of Nottingham, University Park, Nottingham NG7 2RD, U.K.
↵3 Abbreviations used in this paper: DC, dendritic cell; Foxp3, Forkhead box transcription factor 3; Treg, regulatory T cell; nTreg, natural Treg. Gazzinelli, R. T., M. Wysocka, S. Hieny, T. Scharton-Kersten, A. Cheever, R. Kuhn, W. Muller, G. Trinchieri, A. Sher. 1996. In the absence of endogenous IL-10, mice acutely infected with Toxoplasma gondii succumb to a lethal immune response dependent on CD4+ T cells and accompanied by overproduction of IL-12, IFN-γ and TNF-α. J. Immunol. 157: 798-805. Hunter, C. A., L. A. Ellis-Neyes, T. Slifer, S. Kanaly, G. Grunig, M. Fort, D. Rennick, F. G. Araujo. 1997. IL-10 is required to prevent immune hyperactivity during infection with Trypanosoma cruzi. J. Immunol. 158: 3311-3316. Li, C., I. Corraliza, J. Langhorne. 1999. A defect in interleukin-10 leads to enhanced malarial disease in Plasmodium chabaudi chabaudi infection in mice. Infect. Immun. 67: 4435-4442. Fiorentino, D. F., M. W. Bond, T. R. Mosmann. 1989. Two types of mouse T helper cell. IV. Th2 clones secrete a factor that inhibits cytokine production by Th1 clones. J. Exp. Med. 170: 2081-2095. Kamanaka, M., S. T. Kim, Y. Y. Wan, F. S. Sutterwala, M. Lara-Tejero, J. E. Galán, E. Harhaj, R. A. Flavell. 2006. Expression of interleukin-10 in intestinal lymphocytes detected by an interleukin-10 reporter knockin tiger mouse. Immunity 25: 941-952. Demangel, C., P. Bertolino, W. J. Britton. 2002. 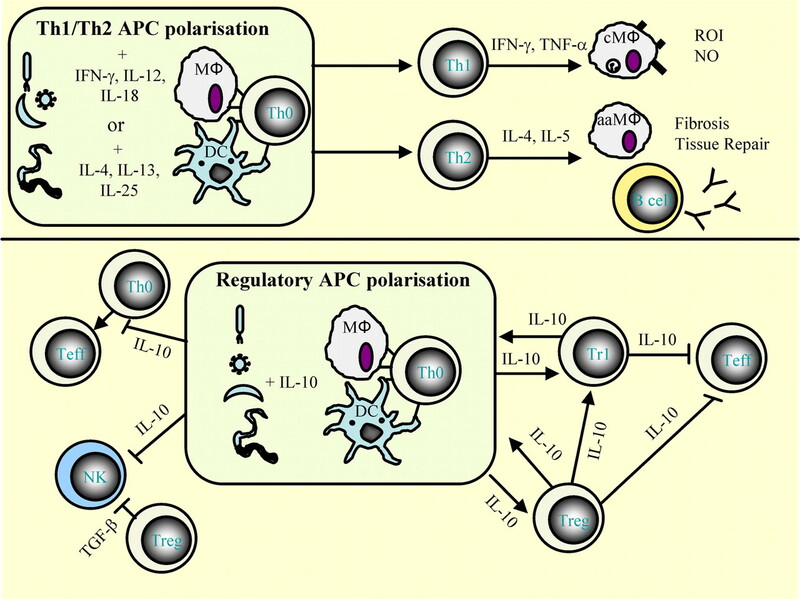 Autocrine IL-10 impairs dendritic cell (DC)-derived immune responses to mycobacterial infection by suppressing DC trafficking to draining lymph nodes and local IL-12 production. Eur. J. Immunol. 32: 994-1002. Schandene, L., C. Alonso-Vega, F. Willems, C. Gerard, A. Delvaux, T. Velu, R. Devos, M. de Boer, M. Goldman. 1994. B7/CD28-dependent IL-5 production by human resting T cells is inhibited by IL-10. J. Immunol. 152: 4368-4374. Joss, A., M. Akdis, A. Faith, K. Blaser, C. A. Akdis. 2000. IL-10 directly acts on T cells by specifically altering the CD28 co-stimulation pathway. Eur. J. Immunol. 30: 1683-1690. Wilson, E. H., U. Wille-Reece, F. Dzierszinski, C. A. Hunter. 2005. A critical role for IL-10 in limiting inflammation during toxoplasmic encephalitis. J Neuroimmunol. 165: 63-74. Magez, S., B. Stijlemans, G. Caljon, H. P. Eugster, P. De Baetselier. 2002. Control of experimental Trypanosoma brucei infections occurs independently of lymphotoxin-α induction. Infect. Immun. 70: 1342-1351. Grau, G. E., L. F. Fajardo, P. F. Piguet, B. Allet, P. H. Lambert, P. Vassalli. 1987. Tumor necrosis factor (cachectin) as an essential mediator in murine cerebral malaria. Science 237: 1210-1212. Rudin, W., N. Favre, G. Bordmann, B. Ryffel. 1997. Interferon-γ is essential for the development of cerebral malaria. Eur. J. Immunol. 27: 810-815. Bekker, L. G., G. Maartens, L. Steyn, G. Kaplan. 1998. Selective increase in plasma tumor necrosis factor-α and concomitant clinical deterioration after initiating therapy in patients with severe tuberculosis. J. Infect. Dis. 178: 580-584. Suvas, S., A. K. Azkur, B. S. Kim, U. Kumaraguru, B. T. Rouse. 2004. CD4+CD25+ regulatory T cells control the severity of viral immunoinflammatory lesions. J. Immunol. 172: 4123-4132. Couper, K. N., D. G. Blount, M. S. Wilson, Y. Belkaid, R. A. Flavell, J. B. de Souza, and E. M. Riley. IL-10 from CD4+CD25−Foxp3−CD127− adaptive regulatory T cells modulates parasite clearance and pathology during malaria infection. PLoS Pathog. In press. Grunig, G., D. B. Corry, M. W. Leach, B. W. Seymour, V. P. Kurup, D. M. Rennick. 1997. Interleukin-10 is a natural suppressor of cytokine production and inflammation in a murine model of allergic bronchopulmonary aspergillosis. J. Exp. Med. 185: 1089-1099. Wilson, M. S., E. Elnekave, M. M. Mentink-Kane, M. G. Hodges, J. T. Pesce, T. R. Ramalingam, R. W. Thompson, M. Kamanaka, R. A. Flavell, A. Keane-Myers, et al 2007. IL-13Rα2 and IL-10 coordinately suppress airway inflammation, airway-hyperreactivity, and fibrosis in mice. J. Clin. Invest. 117: 2941-2951. Hoffmann, K. F., A. W. Cheever, T. A. Wynn. 2000. IL-10 and the dangers of immune polarization: excessive type 1 and type 2 cytokine responses induce distinct forms of lethal immunopathology in murine schistosomiasis. J. Immunol. 164: 6406-6416. Wynn, T. A.. 2004. Fibrotic disease and the TH1/TH2 paradigm. Nat. Rev. Immunol. 4: 583-594. Nelson, D. R., G. Y. Lauwers, J. Y. Lau, G. L. Davis. 2000. Interleukin 10 treatment reduces fibrosis in patients with chronic hepatitis C: a pilot trial of interferon nonresponders. Gastroenterology 118: 655-660. Hernandez-Pando, R., D. Aguilar, M. L. Hernandez, H. Orozco, G. Rook. 2004. Pulmonary tuberculosis in BALB/c mice with non-functional IL-4 genes: changes in the inflammatory effects of TNF-α and in the regulation of fibrosis. Eur. J. Immunol. 34: 174-183. Wohlleben, G., C. Trujillo, J. Muller, Y. Ritze, S. Grunewald, U. Tatsch, K. J. Erb. 2004. Helminth infection modulates the development of allergen-induced airway inflammation. Int. Immunol. 16: 585-596. Wu, Y., Q. H. Wang, L. Zheng, H. Feng, J. Liu, S. H. Ma, Y. M. Cao. 2007. Plasmodium yoelii: distinct CD4+CD25+ regulatory T cell responses during the early stages of infection in susceptible and resistant mice. Exp. Parasitol. 115: 301-304. Anderson, C. F., S. Mendez, D. L. Sacks. 2005. Nonhealing infection despite Th1 polarization produced by a strain of Leishmania major in C57BL/6 mice. J. Immunol. 174: 2934-2941. Belkaid, Y., K. F. Hoffmann, S. Mendez, S. Kamhawi, M. C. Udey, T. A. Wynn, D. L. Sacks. 2001. The role of interleukin (IL)-10 in the persistence of Leishmania major in the skin after healing and the therapeutic potential of anti-IL-10 receptor antibody for sterile cure. J. Exp. Med. 194: 1497-1506. Murphy, M. L., U. Wille, E. N. Villegas, C. A. Hunter, J. P. Farrell. 2001. IL-10 mediates susceptibility to Leishmania donovani infection. Eur. J. Immunol. 31: 2848-2856. Reed, S. G., C. E. Brownell, D. M. Russo, J. S. Silva, K. H. Grabstein, P. J. Morrissey. 1994. IL-10 mediates susceptibility to Trypanosoma cruzi infection. J. Immunol. 153: 3135-3140. Roque, S., C. Nobrega, R. Appelberg, M. Correia-Neves. 2007. IL-10 underlies distinct susceptibility of BALB/c and C57BL/6 mice to Mycobacterium avium infection and influences efficacy of antibiotic therapy. J. Immunol. 178: 8028-8035. Brooks, D. G., M. J. Trifilo, K. H. Edelmann, L. Teyton, D. B. McGavern, M. B. Oldstone. 2006. Interleukin-10 determines viral clearance or persistence in vivo. Nat. Med. 12: 1301-1309. Ejrnaes, M., C. M. Filippi, M. M. Martinic, E. M. Ling, L. M. Togher, S. Crotty, M. G. von Herrath. 2006. Resolution of a chronic viral infection after interleukin-10 receptor blockade. J. Exp. Med. 203: 2461-2472. Hesse, M., C. A. Piccirillo, Y. Belkaid, J. Prufer, M. Mentink-Kane, M. Leusink, A. W. Cheever, E. M. Shevach, T. A. Wynn. 2004. The pathogenesis of schistosomiasis is controlled by cooperating IL-10-producing innate effector and regulatory T cells. J. Immunol. 172: 3157-3166. Groux, H., F. Cottrez, M. Rouleau, S. Mauze, S. Antonenko, S. Hurst, T. McNeil, M. Bigler, M. G. Roncarolo, R. L. Coffman. 1999. A transgenic model to analyze the immunoregulatory role of IL-10 secreted by antigen-presenting cells. J. Immunol. 162: 1723-1729. Feng, C. G., M. C. Kullberg, D. Jankovic, A. W. Cheever, P. Caspar, R. L. Coffman, A. Sher. 2002. Transgenic mice expressing human interleukin-10 in the antigen-presenting cell compartment show increased susceptibility to infection with Mycobacterium avium associated with decreased macrophage effector function and apoptosis. Infect. Immun. 70: 6672-6679. Anderson, C. F., M. Oukka, V. J. Kuchroo, D. Sacks. 2007. CD4+CD25−Foxp3− Th1 cells are the source of IL-10-mediated immune suppression in chronic cutaneous leishmaniasis. J. Exp. Med. 204: 285-297. Karp, C. L., S. H. el-Safi, T. A. Wynn, M. M. Satti, A. M. Kordofani, F. A. Hashim, M. Hag-Ali, F. A. Neva, T. B. Nutman, D. L. Sacks. 1993. In vivo cytokine profiles in patients with kala-azar. Marked elevation of both interleukin-10 and interferon-γ. J. Clin. Invest. 91: 1644-1648. Kapsenberg, M. L.. 2003. Dendritic-cell control of pathogen-driven T-cell polarization. Nat. Rev. Immunol. 3: 984-993. Mills, K. H.. 2004. Regulatory T cells: friend or foe in immunity to infection?. Nat. Rev. Immunol. 4: 841-855. Boonstra, A., R. Rajsbaum, M. Holman, R. Marques, C. Asselin-Paturel, J. P. Pereira, E. E. Bates, S. Akira, P. Vieira, Y. J. Liu, et al 2006. Macrophages and myeloid dendritic cells, but not plasmacytoid dendritic cells, produce IL-10 in response to MyD88- and TRIF-dependent TLR signals, and TLR-independent signals. J. Immunol. 177: 7551-7558. Fujita, S., K. Seino, K. Sato, Y. Sato, K. Eizumi, N. Yamashita, M. Taniguchi, K. Sato. 2006. Regulatory dendritic cells act as regulators of acute lethal systemic inflammatory response. Blood 107: 3656-3664. Han, X., S. Wang, Y. Fan, J. Yang, L. Jiao, H. Qiu, X. Yang. 2006. Chlamydia infection induces ICOS ligand-expressing and IL-10-producing dendritic cells that can inhibit airway inflammation and mucus overproduction elicited by allergen challenge in BALB/c mice. J. Immunol. 176: 5232-5239. Higgins, S. C., E. C. Lavelle, C. McCann, B. Keogh, E. McNeela, P. Byrne, B. O’Gorman, A. Jarnicki, P. McGuirk, K. H. Mills. 2003. Toll-like receptor 4-mediated innate IL-10 activates antigen-specific regulatory T cells and confers resistance to Bordetella pertussis by inhibiting inflammatory pathology. J. Immunol. 171: 3119-3127.
van der Kleij, D., E. Latz, J. F. Brouwers, Y. C. Kruize, M. Schmitz, E. A. Kurt-Jones, T. Espevik, E. C. de Jong, M. L. Kapsenberg, D. T. Golenbock, et al 2002. A novel host-parasite lipid cross-talk. Schistosomal lyso-phosphatidylserine activates Toll-like receptor 2 and affects immune polarization. J. Biol. Chem. 277: 48122-48129. Jang, S., S. Uematsu, S. Akira, P. Salgame. 2004. IL-6 and IL-10 induction from dendritic cells in response to Mycobacterium tuberculosis is predominantly dependent on TLR2-mediated recognition. J. Immunol. 173: 3392-3397. Perry, J. A., C. S. Olver, R. C. Burnett, A. C. Avery. 2005. Cutting Edge: the acquisition of TLR tolerance during malaria infection impacts T cell activation. J. Immunol. 174: 5921-5925. Sponaas, A. M., E. T. Cadman, C. Voisine, V. Harrison, A. Boonstra, A. O’Garra, J. Langhorne. 2006. Malaria infection changes the ability of splenic dendritic cell populations to stimulate antigen-specific T cells. J. Exp. Med. 203: 1427-1433. Yanagawa, Y., K. Onoe. 2007. Enhanced IL-10 production by TLR4- and TLR2-primed dendritic cells upon TLR restimulation. J. Immunol. 178: 6173-6180.
den Haan, J. M., G. Kraal, M. J. Bevan. 2007. Cutting edge: lipopolysaccharide induces IL-10-producing regulatory CD4+ T cells that suppress the CD8+ T cell response. J. Immunol. 178: 5429-5433. Edwards, J. P., X. Zhang, K. A. Frauwirth, D. M. Mosser. 2006. Biochemical and functional characterization of three activated macrophage populations. J. Leukocyte Biol. 80: 1298-1307. Kane, M. M., D. M. Mosser. 2001. The role of IL-10 in promoting disease progression in leishmaniasis. J. Immunol. 166: 1141-1147. Netea, M. G., R. Sutmuller, C. Hermann, C. A. Van der Graaf, J. W. Van der Meer, J. H. van Krieken, T. Hartung, G. Adema, B. J. Kullberg. 2004. Toll-like receptor 2 suppresses immunity against Candida albicans through induction of IL-10 and regulatory T cells. J. Immunol. 172: 3712-3718. Sing, A., D. Rost, N. Tvardovskaia, A. Roggenkamp, A. Wiedemann, C. J. Kirschning, M. Aepfelbacher, J. Heesemann. 2002. Yersinia V-antigen exploits Toll-like receptor 2 and CD14 for interleukin 10-mediated immunosuppression. J. Exp. Med. 196: 1017-1024. Katakura, T., M. Miyazaki, M. Kobayashi, D. N. Herndon, F. Suzuki. 2004. CCL17 and IL-10 as effectors that enable alternatively activated macrophages to inhibit the generation of classically activated macrophages. J. Immunol. 172: 1407-1413. Balcewicz-Sablinska, M. K., H. Gan, H. G. Remold. 1999. Interleukin 10 produced by macrophages inoculated with Mycobacterium avium attenuates mycobacteria-induced apoptosis by reduction of TNF-α activity. J. Infect. Dis. 180: 1230-1237. Butcher, B. A., L. Kim, A. D. Panopoulos, S. S. Watowich, P. J. Murray, E. Y. Denkers. 2005. IL-10-independent STAT3 activation by Toxoplasma gondii mediates suppression of IL-12 and TNF-α in host macrophages. J. Immunol. 174: 3148-3152. Barthlott, T., H. Moncrieffe, M. Veldhoen, C. J. Atkins, J. Christensen, A. O’Garra, B. Stockinger. 2005. CD25+CD4+ T cells compete with naive CD4+ T cells for IL-2 and exploit it for the induction of IL-10 production. Int. Immunol. 17: 279-288. Setoguchi, R., S. Hori, T. Takahashi, S. Sakaguchi. 2005. Homeostatic maintenance of natural Foxp3+ CD25+ CD4+ regulatory T cells by interleukin (IL)-2 and induction of autoimmune disease by IL-2 neutralization. J. Exp. Med. 201: 723-735. Wan, Y. Y., R. A. Flavell. 2007. Regulatory T-cell functions are subverted and converted owing to attenuated Foxp3 expression. Nature 445: 766-770. Sakaguchi, S.. 2005. Naturally arising Foxp3-expressing CD25+CD4+ regulatory T cells in immunological tolerance to self and non-self. Nat. Immunol. 6: 345-352. Belkaid, Y.. 2007. Regulatory T cells and infection: a dangerous necessity. Nat. Rev. Immunol. 7: 875-888. Kullberg, M. C., D. Jankovic, P. L. Gorelick, P. Caspar, J. J. Letterio, A. W. Cheever, A. Sher. 2002. Bacteria-triggered CD4+ T regulatory cells suppress Helicobacter hepaticus-induced colitis. J. Exp. Med. 196: 505-515. Belkaid, Y., C. A. Piccirillo, S. Mendez, E. M. Shevach, D. L. Sacks. 2002. CD4+CD25+ regulatory T cells control Leishmania major persistence and immunity. Nature 420: 502-507. Shevach, E. M.. 2006. From vanilla to 28 flavors: multiple varieties of T regulatory cells. Immunity 25: 195-201. Groux, H., A. O’Garra, M. Bigler, M. Rouleau, S. Antonenko, J. E. de Vries, M. G. Roncarolo. 1997. A CD4+ T-cell subset inhibits antigen-specific T-cell responses and prevents colitis. Nature 389: 737-742. Chen, Y., V. K. Kuchroo, J. Inobe, D. A. Hafler, H. L. Weiner. 1994. Regulatory T cell clones induced by oral tolerance: suppression of autoimmune encephalomyelitis. Science 265: 1237-1240. Maynard, C. L., L. E. Harrington, K. M. Janowski, J. R. Oliver, C. L. Zindl, A. Y. Rudensky, C. T. Weaver. 2007. Regulatory T cells expressing interleukin 10 develop from Foxp3+ and Foxp3− precursor cells in the absence of interleukin 10. Nat. Immunol. 8: 931-941. Stumhofer, J. S., J. S. Silver, A. Laurence, P. M. Porrett, T. H. Harris, L. A. Turka, M. Ernst, C. J. Saris, J. J. O’Shea, C. A. Hunter. 2007. Interleukins 27 and 6 induce STAT3-mediated T cell production of interleukin 10. Nat. Immunol. 8: 1363-1371. Gerosa, F., C. Paganin, D. Peritt, F. Paiola, M. T. Scupoli, M. Aste-Amezaga, I. Frank, G. Trinchieri. 1996. Interleukin-12 primes human CD4 and CD8 T cell clones for high production of both interferon-γ and interleukin-10. J. Exp. Med. 183: 2559-2569. Vanden Eijnden, S., S. Goriely, D. De Wit, F. Willems, M. Goldman. 2005. IL-23 up-regulates IL-10 and induces IL-17 synthesis by polyclonally activated naive T cells in human. Eur. J. Immunol. 35: 469-475. Meyaard, L., E. Hovenkamp, S. A. Otto, F. Miedema. 1996. IL-12-induced IL-10 production by human T cells as a negative feedback for IL-12-induced immune responses. J. Immunol. 156: 2776-2782. McGuirk, P., C. McCann, K. H. Mills. 2002. Pathogen-specific T regulatory 1 cells induced in the respiratory tract by a bacterial molecule that stimulates interleukin 10 production by dendritic cells: a novel strategy for evasion of protective T helper type 1 responses by Bordetella pertussis. J. Exp. Med. 195: 221-231. Price, J. D., J. Schaumburg, C. Sandin, J. P. Atkinson, G. Lindahl, C. Kemper. 2005. Induction of a regulatory phenotype in human CD4+ T cells by streptococcal M protein. J. Immunol. 175: 677-684. Roers, A., L. Siewe, E. Strittmatter, M. Deckert, D. Schluter, W. Stenzel, A. D. Gruber, T. Krieg, K. Rajewsky, W. Muller. 2004. T cell-specific inactivation of the interleukin 10 gene in mice results in enhanced T cell responses but normal innate responses to lipopolysaccharide or skin irritation. J. Exp. Med. 200: 1289-1297. Qi, H., V. Popov, L. Soong. 2001. Leishmania amazonensis-dendritic cell interactions in vitro and the priming of parasite-specific CD4+ T cells in vivo. J. Immunol. 167: 4534-4542. Nylen, S., R. Maurya, L. Eidsmo, K. D. Manandhar, S. Sundar, D. Sacks. 2007. Splenic accumulation of IL-10 mRNA in T cells distinct from CD4+CD25+ (Foxp3) regulatory T cells in human visceral leishmaniasis. J. Exp. Med. 204: 805-817. Keller, C. C., O. Yamo, C. Ouma, J. M. Ong’echa, D. Ounah, J. B. Hittner, J. M. Vulule, D. J. Perkins. 2006. Acquisition of hemozoin by monocytes down-regulates interleukin-12 p40 (IL-12p40) transcripts and circulating IL-12p70 through an IL-10-dependent mechanism: in vivo and in vitro findings in severe malarial anemia. Infect. Immun. 74: 5249-5260. Kossodo, S., C. Monso, P. Juillard, T. Velu, M. Goldman, G. E. Grau. 1997. Interleukin-10 modulates susceptibility in experimental cerebral malaria. Immunology 91: 536-540. Holscher, C., M. Mohrs, W. J. Dai, G. Kohler, B. Ryffel, G. A. Schaub, H. Mossmann, F. Brombacher. 2000. Tumor necrosis factor α-mediated toxic shock in Trypanosoma cruzi-infected interleukin 10-deficient mice. Infect. Immun. 68: 4075-4083. Madura Larsen, J., C. Stabell Benn, Y. Fillie, D. van der Kleij, P. Aaby, M. Yazdanbakhsh. 2007. BCG stimulated dendritic cells induce an interleukin-10 producing T-cell population with no T helper 1 or T helper 2 bias in vitro. Immunology 121: 276-282. Fleming, S. D., P. J. Leenen, J. H. Freed, P. A. Campbell. 1999. Surface interleukin-10 inhibits listericidal activity by primary macrophages. J. Leukocyte Biol. 66: 961-967. Ross, P. J., E. C. Lavelle, K. H. Mills, A. P. Boyd. 2004. Adenylate cyclase toxin from Bordetella pertussis synergizes with lipopolysaccharide to promote innate interleukin-10 production and enhances the induction of Th2 and regulatory T cells. Infect. Immun. 72: 1568-1579. Sadler, C. H., L. I. Rutitzky, M. J. Stadecker, R. A. Wilson. 2003. IL-10 is crucial for the transition from acute to chronic disease state during infection of mice with Schistosoma mansoni. Eur. J. Immunol. 33: 880-888. Chen, C. C., S. Louie, B. A. McCormick, W. A. Walker, H. N. Shi. 2006. Helminth-primed dendritic cells alter the host response to enteric bacterial infection. J. Immunol. 176: 472-483. Segura, M., Z. Su, C. Piccirillo, M. M. Stevenson. 2007. Impairment of dendritic cell function by excretory-secretory products: a potential mechanism for nematode-induced immunosuppression. Eur. J. Immunol. 37: 1887-1904. Ji, J., G. K. Sahu, V. L. Braciale, M. W. Cloyd. 2005. HIV-1 induces IL-10 production in human monocytes via a CD4-independent pathway. Int. Immunol. 17: 729-736. Elrefaei, M., F. L. Ventura, C. A. Baker, R. Clark, D. R. Bangsberg, H. Cao. 2007. HIV-specific IL-10-positive CD8+ T cells suppress cytolysis and IL-2 production by CD8+ T cells. J. Immunol. 178: 3265-3271. Brady, M. T., A. J. MacDonald, A. G. Rowan, K. H. Mills. 2003. Hepatitis C virus non-structural protein 4 suppresses Th1 responses by stimulating IL-10 production from monocytes. Eur. J. Immunol. 33: 3448-3457. Humphreys, I. R., C. de Trez, A. Kinkade, C. A. Benedict, M. Croft, C. F. Ware. 2007. Cytomegalovirus exploits IL-10-mediated immune regulation in the salivary glands. J. Exp. Med. 204: 1217-1225. Redpath, S., A. Angulo, N. R. Gascoigne, P. Ghazal. 1999. Murine cytomegalovirus infection down-regulates MHC class II expression on macrophages by induction of IL-10. J. Immunol. 162: 6701-6707. Montagnoli, C., A. Bacci, S. Bozza, R. Gaziano, P. Mosci, A. H. Sharpe, L. Romani. 2002. B7/CD28-dependent CD4+CD25+ regulatory T cells are essential components of the memory-protective immunity to Candida albicans. J. Immunol. 169: 6298-6308.